This 190 page book was self-published by Dr. Ken Johnson in January of 2010. 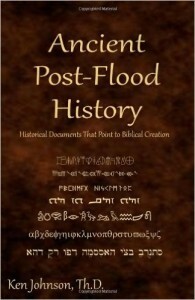 In it, Dr. Johnson explores the recorded history of civilization prior to Noah’s Flood and the historical chronicles of nations and kingdoms that were established after the flood, noting their founders and the family lineage of their founders. It doesn’t bog down in details and thus proves to be a fascinating overview of the annals of ancient empires. 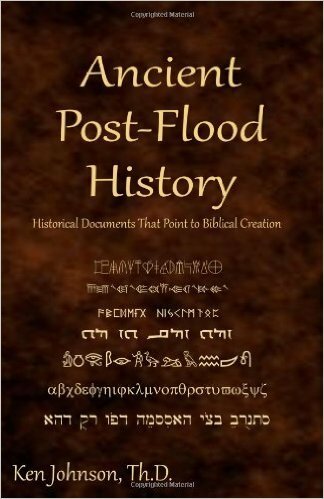 One of the things that sets this book apart from others, which tend to provide similar material, is the initial identification of ancient documents and their origins. Why are certain manuscripts considered trustworthy, while others are considered contaminated with modern bias? Revealing sources and verifying the reliability of those sources takes personal opinion, ideology and bias out of the mix and leaves the reader face to face with information that sets cornerstones neatly and firmly into place. Once the foundation stones are in place, bridges of connection can be built from the history with which the reader is most familiar to the ancient history that waits to be discovered. Overall, this is not a deep read. But, although it’s fairly light in content, it connects the dots between the three sons of Noah to our modern world with bold, clean lines. Some of the national histories that are covered include: England, Denmark, Norway, France, Germany, Greece, Ireland, Scotland, Italy, Russia, China, India, Iran, Iraq, Egypt, and others. I enjoyed reading this book and found myself thumbing back through the pages from time to time in an effort to refresh my memory as I read other, more detailed texts.